Sri Lanka has always been known as the Island of Spices, but today, the industry faces a number of challenges, many of which are common to the slow deaths of numerous traditional industries, from handicrafts to cultivation. Those engaged in the spice industry are both smallholders and large-scale cultivators. The Matale district, which is a hub for spices, has suffered great losses during recent times, mainly due to the sharp drop in the prices of spices—especially that of pepper. J. L. M. Maharoof is one of the many smallholder pepper cultivators living in Matale. His main livelihood is derived from the sale of pepper to those who visit his cultivation. Prior to the downward trend in pepper prices, he had previously sold a kilogram of pepper at prices between Rs. 1,400 and Rs. 1,500, but currently, a kilogram of pepper only fetches Rs. 600—less than half of the usual price, he said. Maharoof, like many other pepper cultivators, now have to find other alternatives to make a living. “The government is yet to take any measures to improve the price of Sri Lankan pepper in the local market,” he added. D. S. Samaraweera of Ukuwela in Matale, in the meantime, said he could no longer afford to hire workers at his pepper cultivation, as the cost of labour and the price of organic fertilizer for his cultivation made production costs too high to be profitable. Bandula Karunaratne of Udurawana, Wattegama in Matale said he had cultivated 43 acres of pepper and provided employment to many in the area, but since the drop in prices, he has found it difficult to maintain his cultivations. “The spice trade is mainly run by the private sector; we see very little attention being paid by the government to revive the industry,” said Karunaratne. A majority of his workers have left for other jobs and for the time being, he has diverted his efforts to develop his coconut cultivation. When it came to ginger, Sarath Kumara of Diddeniya in Melsiripura, Kurunegala, grew ginger seedlings to be sold to other farmers. His seedlings could be sold for Rs. 800 per kilogram, and he was looking to get into the export market. Kumara’s main complaint was that the Export Development Board did not provide much support for their exports. No systematic steps had been taken so far to expand ginger cultivation and encourage people in the district to cultivate ginger—a spice which is in high-demand in the world market, he added. Ruwandi Perera, who was trained in Australia and Malaysia on Business Management, is the owner of the Euphoria Spice Garden in Matale. She revealed that many of the guides employed at spice gardens, spoil the country’s reputation by giving wrong information on spices to foreign tourists. “These self-proclaimed guides know nothing about the ingredients or the diversity of essential oils found in spices. They should be given proper training on spices and their food and medicinal values,” she further said. 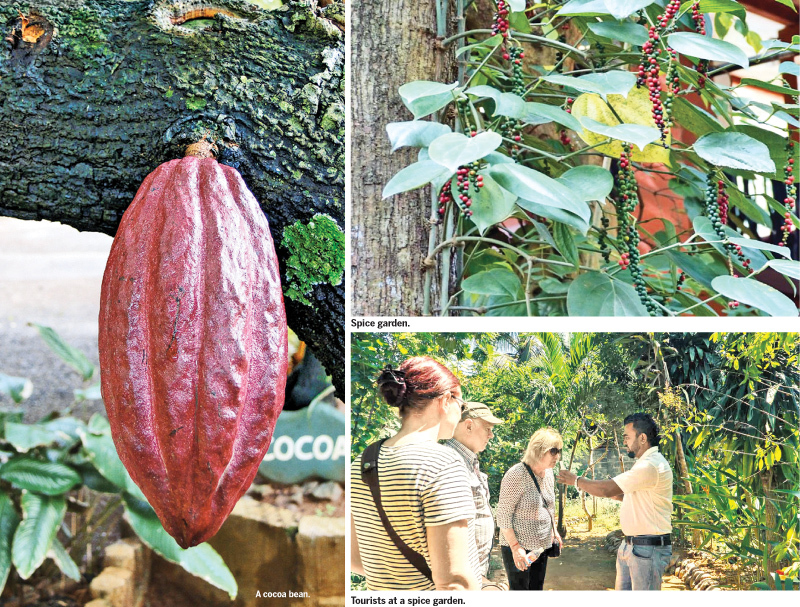 Perera requested that authorities such as the Sri Lanka Tourist Board and the Export Agriculture Department should step in to rescue the spice trade in Sri Lanka. If proper action was not taken, Sri Lanka could soon disappear from the map of spice islands, she added. When inquiries were made regarding the situation of spices and the low prices paid for pepper in the export market, Kandy Gatambe Export Agricultural Department Director General Dr. A. T. Heenkenda said Sri Lanka provided only five percent of pepper to the world market. He added that steps would be taken to recover a better price and to further improve the country's local and international spice trade. Media reports from Vietnam show that the trade imbalance is also affecting its own farmers. Last week, the Vietnamese media reported that pepper growers entering the harvest season of 2018 in the southeastern region of Vietnam, were concerned about the price fall and output reduction because of pests and diseases. Traders now pay VND 65,000 - VND 66,000 for a kilogram of pepper, accounting for half of the price in the same period last year, they further reported. Long-lasting rains last year created conditions for pests and diseases to attack pepper crops, resulting in an output drop this year. “According to statistics, high pepper prices in previous years sent farmers to expand their farming areas to 40,100 hectares in the Ba Ria-Vung Tau, Dong Nai, and Binh Phuoc provinces in 2017. The area far exceeds the plan of of the Vietnamese government, which was to be 12,800 hectares by 2020. That has broken the supply and demand balance, causing continuous price reductions for the last two years,” said Vietnamese media reports. Mid last year, Sri Lankan pepper cultivators too took to the streets in protests of falling pepper prices. At the time, they blamed the government’s policy of the excessive importation of pepper over the fall in local pepper prices. However, an overall look at the industry and a national policy to bring about changes, thus, would impact the spice trade for the better in the country—once again making it the Indian Ocean’s hub of spices.